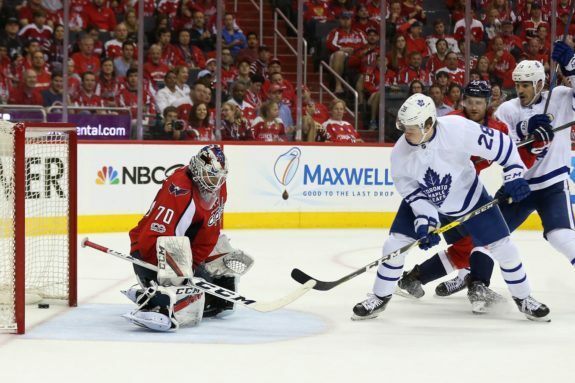 Should Leafs Offer Weal a Deal? Jordan Weal isn’t a household name by any means. In fact, when the 2016-17 NHL campaign came to a close, the North Vancouver, British Columbia, native had skated in just 37 career games. So, how is it that the UFA is attracting such an immense amount of attention – as well as suitors – from throughout the league? Well, as I wrote in May of 2015, Weal is an excellent young player of terrific skill and promise and one who could soon make a substantial impact at hockey’s highest level. The one factor holding him back? Opportunity. The 70th overall choice in the 2010 NHL Entry Draft, Weal has skated largely in the American Hockey League since his ascension to the professional ranks. Yet, despite lighting up the scoresheet on a regular basis, Weal has failed to crack an NHL roster on a full-time basis. As one of the AHL’s most lethal and consistent scorers, his inability to do so has been rather startling. As such, it would appear as though all Weal needs to succeed is a chance. Yet, who in particular is willing to provide him with such an opportunity? 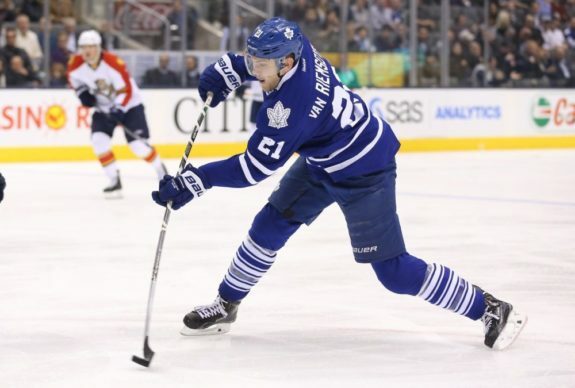 Well, although the offers could be plentiful, the Toronto Maple Leafs are one team which should seriously consider the young forward’s services. At the age of 25, Weal is a dangerous and productive scoring forward who has been a lethal force throughout his entire hockey career. It all began in the Western Hockey League. A product of the Regina Pats, Weal excelled during his four years with the team – which ranged from 2008 to 2012. In total, Weal netted 135 goals and racked up 385 points in 282 WHL games played. His stellar points per game mark of 1.37 reiterated Weal as not only a terrific scorer but a consistent one at that. An assistant captain with the Pats, Weal’s incredible play resulted in his selection by the Los Angeles Kings, where he would soon begin making his impact at the professional level. The 2012-13 AHL season marked the first campaign of Weal’s professional career. Right off of the bat Weal was effective, as he had little trouble acclimatizing himself to the speed and strength of the professional game. As such, by the time the budding star concluded his sophomore season, he had already become an offensive fixture with the Manchester Monarchs. 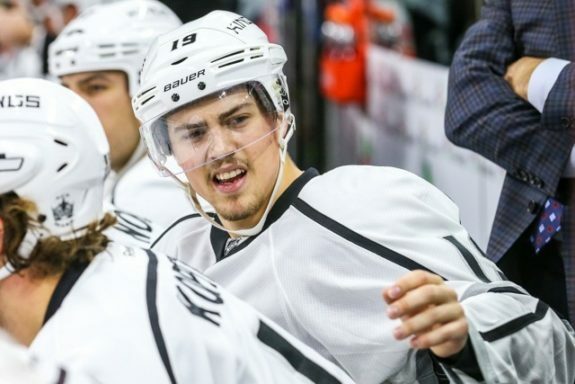 Weal wasted little time in becoming a reliable offensive force with the Manchester Monarchs. Yet, despite a career-best season which featured 23 goals and 70 points in 76 games played, Weal was not afforded the opportunity to gain valuable NHL experience. 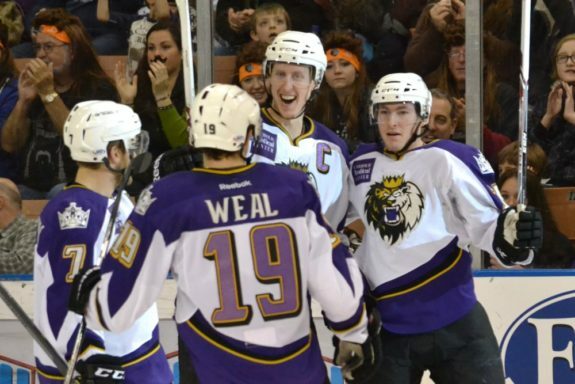 In fairness, the Monarchs’ parent club – the Kings – went on an impressive run and won the Stanley Cup, so adding a player like Weal late in the season made little sense at the time. However, when Weal was returned to Manchester to begin the 2014-15 season, it signalled the beginning of the end of his time within Los Angeles’ organization. As a player clearly ready for NHL playing time, the Kings’ decision to demote Weal despite his tremendous season seemingly indicated their perception of his value and future within the organization. 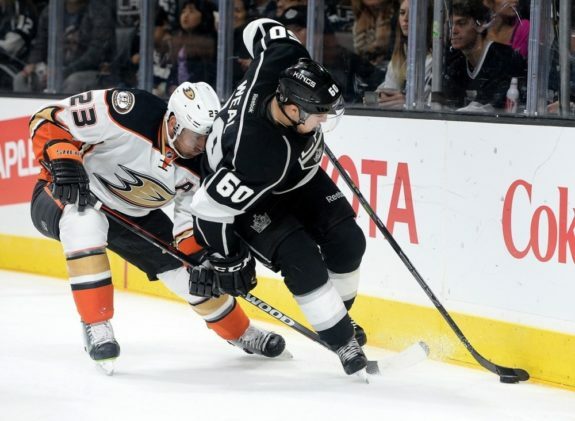 Following yet another fantastic AHL season in which he totalled 69 points – 20 of which were goals – Weal finally got his shot at with the Kings to begin the 2015-16 campaign. However, after just 10 games played, Los Angeles dealt the budding star to Philadelphia in exchange for Luke Schenn and Vincent Lecavalier. 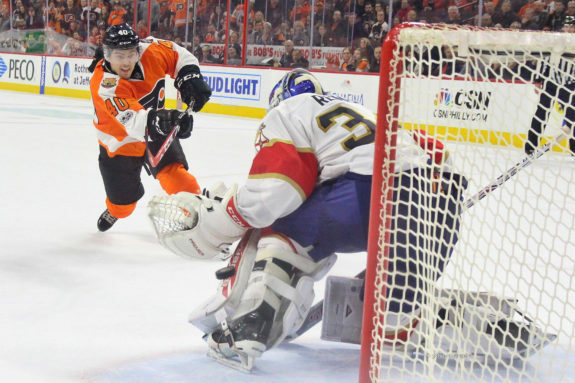 Provided with not only a fresh start but a change in culture, Weal stepped into the Flyers’ lineup and appeared set to establish himself as an everyday NHL player. However, the injury bug quickly struck and Weal was forced out of his new team’s lineup for the vast majority of the season. Finally provided with an opportunity to succeed, an untimely injury was the newest factor inhibiting Weal’s path to NHL success. In all, Weal would skate in 14 NHL games during the 2015-16 season – 10 with the Kings and only four with the Flyers. Regardless, Philadelphia inked Weal to a one-year contract extension in order to see what he was truly capable of when healthy. As such, Weal was subsequently provided with his greatest dose of NHL playing time to date. Despite beginning the year in and tearing up the AHL, Weal wound up skating in 23 games with the Flyers. Of blistering speed and excellent hockey sense, the young prospect wowed Philadelphia and their fans for a short period of time as the season came to an end. Collecting eight goals and 12 points in 23 games played, Weal had finally begun to display the skills and capabilities which had long resulted in his immense and consistent professional success. Having finally shown a glimpse of his talent and promise at the NHL level, Weal, oddly enough, finds himself without a contract as the 2017-18 season approaches. As a young player of incredible talent and untapped potential, Weal’s UFA status is particularly interesting given his lack of NHL experience. While he has long been a fantastic professional player, Weal will suddenly have the ability to – to an extent – choose where he will play next season. Quite obviously, Weal will be looking for an opportunity which best suits his needs – the most notable of which is the ability to log consistent playing time at the NHL level. In fact, a number of NHL organizations are already interested in his services. While the Flyers remain heavily interested in re-signing Weal, the North Vancouver native is reportedly highly interested in playing for his hometown team – the Vancouver Canucks – although he has visited with the Montreal Canadiens as well. Jordan Weal is currently meeting with the Canucks. He also met with Toronto and Montreal this week and has other teams interested as well. One team which Weal also visited while touring the NHL was, in fact, the Leafs. As a rebuilding team constructed upon high-end skill and speed, Weal would be a fantastic addition to a developing Toronto team hungry for talent, productivity, and consistency. Yet, would signing Weal be ideal for the Leafs? Further, where would he play within the organization – especially considering his likely expectation to immediately play at the NHL level? 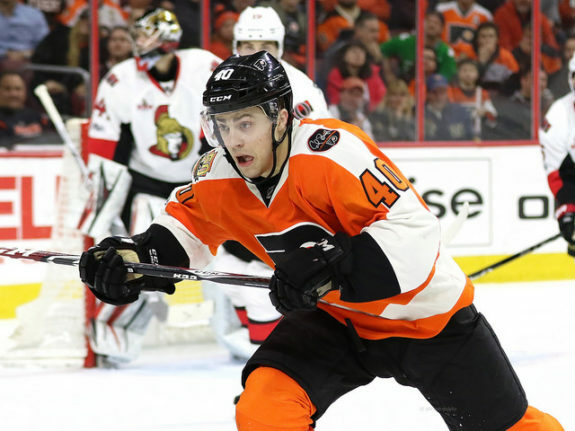 Should the Leafs Target Weal? Well, should Toronto target the promising yet unproven Weal? To answer this question, a number of aspects must first be considered. Firstly and, perhaps most importantly: where would Weal fit into the team’s organizational depth chart? While his talents would certainly be a major addition to the Leafs’ attack, would Weal be provided with enough playing time to not only further develop his game but excel at the NHL level? In looking at Toronto’s projected lineup, it is quite clear that someone would have to move on in order to accommodate Weal. With the top-three forward lines all but set in stone, Weal would likely have to outplay Kasperi Kapanen for a job unless the team is willing to grant him the role of fourth line centre. Yet, even then, would Weal truly be putting himself in a position to succeed? In a role which would likely garner roughly 10:00 of playing time per game, Weal would surely be restless in his quest for greater ice time, responsibility, and production. As such, Weal could once again find himself riding the bus in the AHL, where he has repeatedly proven himself as more than capable. Secondly, what kind of contract would Weal be looking for from the Leafs? As an unproven UFA, Weal will surely be looking for a two-year deal of lesser value. Desiring stability, Weal’s aspiration for a multi-year deal would work for Toronto, yet only at the right financial term. Anything over $1 Million per season would likely be out of the question considering his lack of experience and somewhat ambiguous potential at the NHL level. Further, with a number of elite young players soon to be in need of contract extensions, the Leafs would have to proceed with extreme caution. Are the Leafs the Right Fit? So, with all of this being said, is Toronto the right fit for Weal and his NHL future? Firstly, Weal has to be comfortable signing with the Leafs despite their rebuilding situation. With playing time often difficult to come by, Weal would have to fight for every single second of ice time and especially so if he wishes to become a top-six forward with the organization. With a number of players cemented into the team’s lineup, Weal would have to play exceptionally well to displace any one of the team’s veteran players. Secondly, Weal would need to accept the fact that he could, once again, return to the AHL. Despite dominating the league and proving himself superior, Weal could face another stint in the AHL given Toronto’s deep lineup and the little flexibility which it has to offer. Conversely, one aspect which Weal could have working in his favour is the future of the Leafs’ veteran core. With Tyler Bozak, James van Riemsdyk, and Leo Komarov all slated to become UFAs following the 2017-18 season, Weal could battle his way into contention for a top-six role with the team – if offered a multi-year contract that is. Well, is Toronto the best fit for Weal?? If he is willing to battle for playing time in hopes of landing a crucial role with one of the NHL’s most storied franchises, then yes. Of immense potential and incredibly skilled, Weal should develop into a quality and reliable NHL player. With a proven history of lethality, Weal simply needs an opportunity to thrive and Toronto could very well be the team to grant his wish. However, a team such as the Canucks could be a much more entertaining option. Considering his birthplace and the abhorrent state of the team, signing with the Canucks could be a safer route given the playing time he could command and the multi-year contract which he would surely receive. Like any player of elite skill and drive, the Leafs must be incredibly interested in Weal’s services. Although he isn’t a franchise altering player, Weal could play a major role with the Leafs in the immediate future if provided an opportunity to do so – he is, in fact, that good.